A handy app to convert between different currencies. Supports 32 currencies. "Flip" button lets you easily switch between "to" and "from" fields. You can select the number of decimal places you want to display. You can use the currency converter and price exchange calculator offline. It stores the last updated rates so you can easily convert prices without Internet access. 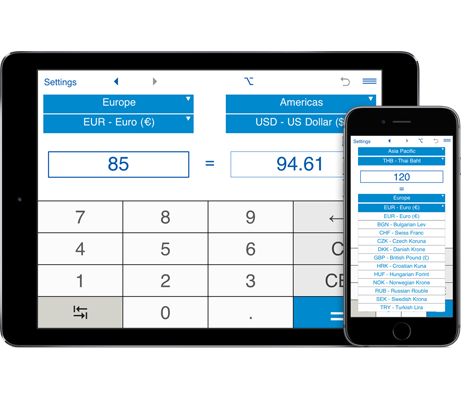 Currency converter supports 32 currencies: Australian Dollar, US Dollar, Euro, Bulgarian Lev, Brazilian Real, Canadian Dollar, Swiss Franc, Chinese Yuan, Czech Koruna, Danish Krone, British Pound, Hong Kong Dollar, Croatian Kuna, Hungarian Forint, Indonesian Rupiah, Israeli Shekel, Indian Rupee, Japanese Yen, South Korean Won, Mexican Peso, Malaysian Ringgit, Norwegian Krone, New Zealand Dollar, Philippine Peso, Polish Zloty, Romanian Leu, Russian Rouble, Swedish Krona, Singapore Dollar, Thai Baht, Turkish Lira, South African Rand. Exchange rates are updated automatically. The source of the information is the Czech National Bank.